There comes a time in every baby’s life when he or she is ready to start on solids. And when that point comes, you’re going to be just a little bit overwhelmed with all of the different options, like Beech-Nut and Gerber Baby Foods and which to choose between the two. On the surface, they might seem like virtually the same kind of food option for your growing baby or toddler, but there are a few differences that set them apart from one another. When you look at the consistency of the different baby foods, the different kind of containers they both come in and, of course, the cost, you can see how they both differ from each other. You’re also likely to understand why one may be the stronger option over the other. As with most baby foods, Beech-Nut comes in a variety of different flavors with options for young babies and even toddlers. Likewise, Gerber has not only a variety of different baby food options but also baby and toddler snacks to help them get used to solid foods. That probably doesn’t make it any easier to choose between the two, but Gerber also tends to have a thicker consistency that your baby may have a hard time digesting at first. Then again, Beech-Nut isn’t necessarily as easy to find in a pinch at the grocery store. The best thing to do is to compare them both and figure it out that way, but regardless, your baby is sure to have a healthy baby food option in either brand. Bottom Line Up Front: I much prefer giving my little ones the organic – clean ingredients without filler – found in Beech-Nut products here. The consistency in Beech-Nut baby food is easier to ingest. Gerber baby food comes in jars that you can reuse because of the style of the lid. Beech-Nut lids are for single use. The price of Beech-Nut baby food is more affordable for most families. To make the healthiest baby food possible, Beech-Nut Baby Food uses the least amount of steps between putting ingredients together and cooking it. This ensures not only a pleasing flavor for your baby or toddler but also the right kind of texture that will agree with sensitive tummies. Regardless of what foods you choose for your little one, all Beech-Nut baby food is made with 100% natural ingredients. The company’s goal is to make authentic baby food from real ingredients, cooked in a way similar to how you as a parent would make it yourself. Beech-Nut uses the method of mixing and pureeing the food before it’s cooked, and the air is then taken out to preserve the freshness of the food. This means that there’s no need for any added ingredients, natural or artificial. Even the pouches and glass jars were explicitly chosen to keep the contents tasting normal. This way, there’s less of a chance of the taste of your baby’s food being affected by plastic containers, and you can be sure that the glass jar is safe and BPA-free. From choosing ingredients to the actual packaging, Beech-Nut seems to have taken great care in their baby food every step of the way. Flavors/Varieties: Beech-Nut Baby Food comes in yogurt melts, cereal puffs, granola bars, cereals, baby food jars, and baby food pouches. Flavors include apple and green beans, corn and potato chowder, and mango, chicken, curry, and rice. Age Range: Foods from the brand are made for children from four months and up. Baby Food Container Style: The baby food comes in glass jars and pouches. 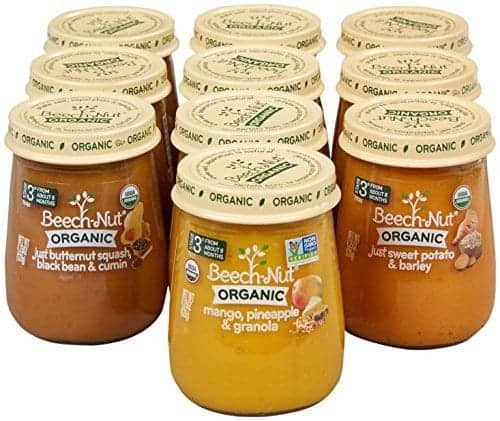 Price: On Amazon, a pack of 10 four-ounce jars of Beech-Nut Baby Food is $18. Check out the latest price! Where To Buy: You can buy it on Amazon or in-store at Walmart and Target. Has This Item Been Recalled? : While there are some complaints about Beech-Nut Baby Food, there are no recent or current recalls. Even if you don’t buy the organic Beech-Nut Baby Food, the ingredients are still all natural and healthy. Unlike other baby foods, there are no added artificial ingredients. With glass jars, you can be sure that your baby’s food will come in safe and BPA-free containers. Beech-Nut has foods for babies of almost every age, including toddlers. While glass jars are safer for the contents, there is the chance of accidentally dropping and breaking jars of Beech-Nut baby food. Given the wide variety of flavors, there may be some specific food combinations that your child doesn’t like, so it’s more of a trial and error process. When you order packs of the jarred baby food online, you run the risk of receiving some broken jars in the box. “I love Beech-Nut! Good consistency (and consistently so) and on target for the age range. Always smells and looks appetizing, with wholesome ingredients. Nothing to complain about and my daughter laps this up.” – Annie V. on Amazon. “Both kids lived this brand. They make a variety of good flavors. What we like the most about it is how it’s organic. Plus it’s only made up of the two or three organic vegetables that are listed on the jar.” – Amrou Awaysheh on Amazon. “Love these, all real ingredients and very healthy. Easy to travel with and my son loves them! Wish they were a bit more affordable, but for the quality, we will take it!” – Amy Curtis on Amazon. “This is my son’s favorite! I love that it is thick and doesn’t drip off the spoon. I also love the ease of simply opening the cap instead of having to pull back hard to grip foil on other brands.” – Amber L. on Amazon. With Gerber baby food, the brand ensures that the different fruit and vegetable combinations are just right for your little one thanks to the panel of babies who test out each new baby food before it hits the shelves. Each stage that Gerber offers brings something new to the table for babies to enjoy and become familiar with. 1st Foods are made to be as smooth as possible for easier digestion and the most part; they don’t contain too many complicate fruits or veggies to incorporate too early into your baby’s diet. 2nd Foods are equally as smooth, but they contain a wider variety of ingredients to further your child’s palate. Once you get to the toddler and crawler stages within Gerber baby foods, you can introduce your little one to baby food pouches and Lil’ Bits. The Gerber Lil’ Bits are thicker than the other baby foods from Gerber, and they include recipes like Chicken Itty-Bitty Noodle Dinner and Farmer’s Market Vegetable & Turkey Dinner. Unlike Beech-Nut, most Gerber baby foods don’t come in glass jars, but there are different jars, plastic containers, and pouches to choose from, depending on what your baby likes. Flavors/Varieties: Gerber baby food offers fruit and vegetable squeeze pouches, organic jarred foods, small plastic containers, puffs, cereal, and cereal bars. The different food combinations include apple-strawberry-beet, pear-spinach, and herb vegetable pasta chicken dinner. Age Range: Gerber offers food for both babies and toddlers, starting with babies who can sit up supported. Baby Food Container Style: In addition to some glass jars, Gerber also offers baby food in pouches and plastic containers with peel back films and plastic lids. Price: On Amazon, a pack of eight two-ounce Gerber Purees 1st Foods is $8. Check out the latest price! Where To Buy: You can buy Gerber baby food on Amazon or in-store at Target and Walmart. Has This Item Been Recalled? : There are no official recalls on Gerber baby food, but there are reports of trace amounts of metals being found in some varieties of the baby food. Compared to other baby foods, like Beech-NutBeech-Nut, Gerber baby food is a lot more affordable for some families. Each stage of the baby food is designed to be easily digestible for different children in the correct age and development stage. Because of the reusable lid on the small plastic containers of baby food, you can save any remaining food for later if need be. The first size, at two ounces, is just the right size for babies starting out with solids. 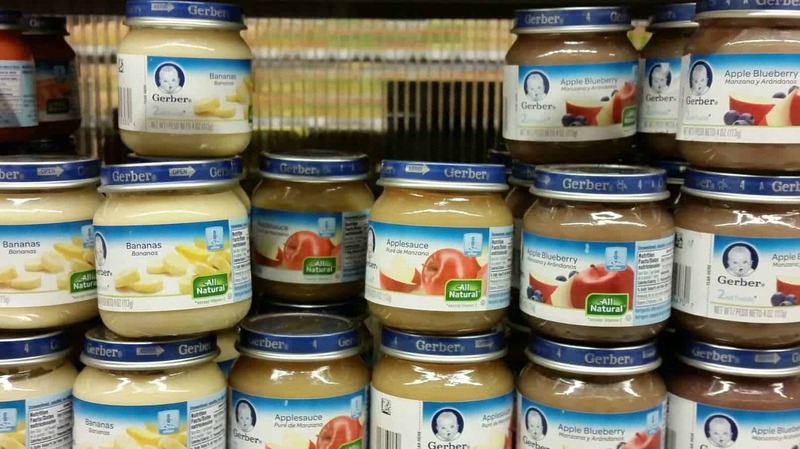 Gerber baby food has a longer shelf life than some other baby foods, but that could mean that it has added preservatives that some parents may not love. To thicken some of the other more advanced Gerber options, cornstarch is added, which may not sit well with some babies’ stomachs. Some vegetables may be very bland or have almost no flavor, making them unpleasant for little ones. “Great price and my kids love it — can’t go wrong. It sometimes is a bit cheaper than the grocery store, and comes to your door… what more could you ask for? I’ve never had quality issues with this.” – Laura B. on Amazon. “So far I’ve purchased the flavors peas, carrots, butternut squash, pumpkin, and green beans. My baby loves them all. What’s more is the convenience of purchasing them online and having them delivered in bulk to my home — so easy!” – R. Entler on Amazon. “This is great for your little one, no artificial flavors or additives. But I found out after buying the stage 1, that stage 2 is cheaper, and you get more.” – Desiree Calora on Amazon. “For the products — my baby loves this one. I feel good giving her something vegetarian (those little-jarred meat baby foods creep me out – how do they get the meat so gelatinous?!) which tastes somewhat like ‘real’ food instead of just plain veggie or plain fruit all the time.” – H. Harper on Amazon. At the end of the day, all that matters the most is that you find a baby food that your baby enjoys and that they can digest the easiest. When comparing Beech-Nutand Gerber baby foods, though, the stronger option seems to be the Beech-Nut. It’s not only a little less costly, but it also tends to have fewer additives than the Gerber baby food options. Depending on your own child’s preferences, he or she may like the Gerber baby foods more, but it’s also hard to ignore that the consistency of Beech-Nut may be the easiest for little ones. It’s a little thinner than the Gerber baby foods out there, which can be hard for some babies to get used to, but it may also be the easiest for babies just starting out on solids. As long as you’re giving your baby or toddler a healthy baby food that they enjoy, then you’re doing something right. In this case, the Beech-Nut may be the stronger option, but both baby foods are plenty healthy in their ways. Since both brands offer natural and organic options, that’s half the battle in finding the right healthy baby food for your child. Choosing your baby’s first solid food can be hard enough without having to decide between two specific brands that have some clear differences from each other. But while you may at first expect Gerber to be the winning baby food, in this instance, Beech-Nut is the way to go. Definitely cross reference our frequently updated baby food recall list and our best baby food brand ratings for additional context.